as we get older our eyebrows become so sparse that we often give up. One look at a beautiful celebrity tells us how important eyebrows are. brush for application. Check out this page for the right make up tools and let’s get on with how to make up brows and lashes! those below the arch to emphasize the curve. Do this carefully to avoid making the eyebrows too thin. never pull out the white hairs, they can always be coloured. Now use the soft eyebrow pencil to fill in the shape with tiny hairlike strokes. cotton bud is a good tool. Finish with the eyebrow brush and a tiny spot of gel warmed in your hand, to brush the little hairs and the unruly ones up and into the new shape. 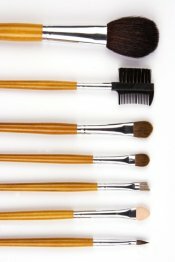 brushes I recommend at The Online Beauty Spot USA or the Online Beauty Spot UK & EU. find out how to make up our lashes to put them back in the limelight. press the curl. Hold for about 30 seconds. How does that look? important inner and lower lashes.We’ll help you choose the best mascara for your needs. look very hard and aging. Choose brownish/black for daytime and save the black for candle light! shadow drawn on the lower lash line with a baby bud is more effective. Get more clever eye make up ideas for mature women here. Learn to use colors and techniques to offset droopy or crepey eyelids and draw attention to your eyes in the softest most youthful way. other anti aging beauty problems like thin lips and facial redness treatment on this website. Take a look around and write to me on my contact me page if you have a question. If I don’t have an answer I usually know someone ho does!